Effect pedals are not compulsory if you play the acoustic guitar, but they will enhance your sound and will make it richer and more interesting, turning playing the guitar into the most enjoyable experience possible. However, if you have an electric guitar, there is no way of playing it at its full potential without effect pedals – without the resonance of an acoustic chamber, the electric guitar will be barely heard without being amplified and without modeling the sound a bit. A guitar effect pedal will add something extra to the typical sound you would get if you were to plug it directly into an amplifier. Whether we are talking about distortion, delay, chorusing or something else, these effects will enhance the sound, giving you more expression and more ways of delivering a song. 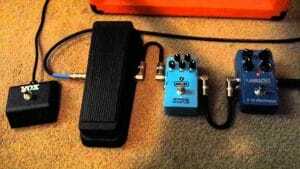 Some pedals will also help you tune your instruments or practice new techniques. By basic pedals, we wanted to describe those gadgets we consider as very important for any guitar player out there. These are used for so many genres, ranging from blues to extreme metal, that we could not leave them aside. Overdrive is the effect which made electric guitars famous back in the day. While at the beginning guitarists would have to turn the volume up on their amplifier to obtain a crunchy sound, this is no longer needed as the overdrive pedal will do this for you. It delivers the distorted, grungy sound of an amplifier at maximum volume, and what is great is that the intensity of the distortion can be controlled. The distortion pedal is an overdrive on steroids – it is more extreme in sound while offering more saturated and thicker tones. While an overdrive will boost the signal without increasing the volume, a distortion pedal clips the waveform, creating the sound usually employed by rock and metal guitarists. Another effect commonly used is the chorus. Usually, these pedals will process your sound, providing a doubling effect by repeating the signal a very short while after you are playing a note. Popular in many songs released during the 80s, they are still in use today in many different genres. When talking about chorus pedals, you cannot leave behind the delay effect. It repeats the sound you send to it at a preset time you can easily adjust from the device control knobs. When used correctly, it can create a wonderfully rich sound, or it can be used to give your signal a hauntingly strange sound. 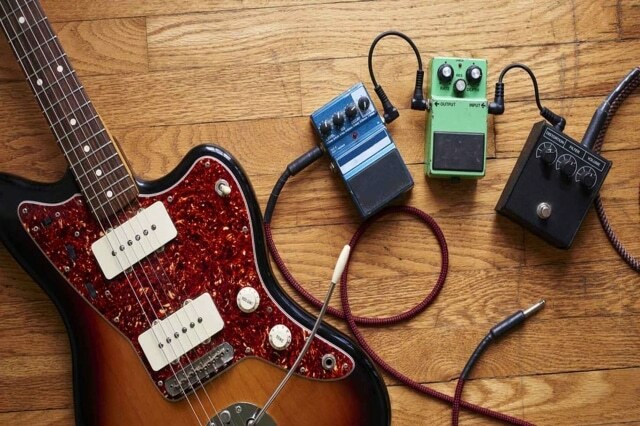 These are some essential guitar effect pedals you should own which modify your signal. Now, we will discuss two other essential gadgets, especially for live performers. The first one is the tuner – even though you can learn how to tune your guitar by ear, while on stage, in a noisy environment where it would be difficult to hear the note you are playing without amplifying it, the tuner allows you to make the adjustments you need to get the correct notes on all strings. When you have to change your tuning between songs, this gadget will prove invaluable. The looper is another item you should not leave aside. It allows you to repeat a part of a song (or the entire tune if the pedal has enough capacity) you can repeat afterward. The pattern you played will be placed on a loop and repeated for as long as you need. Even though it sounds similar to what the delay does, it is not quite the same – however, many manufacturers offer combined delay and loopers. The best looper pedal usually has about 10 to 15 minutes of recording time and will allow you to create more layers by recording over the same pattern multiple times. It is excellent for practicing improvisation and for live performances when, instead of having another guitarist play a single part, you can start the loop by pressing the footswitch. 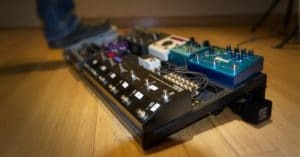 There are so many pedals and guitar processors available that it can be challenging to decide which are some other effects one could use. Some players use so many of them that they create sounds that are truly surreal, making it hard to believe that only one guitar was used to create the soundscape. One such example is the reverb pedal. It mimics the sound of a guitar being played in different settings, such as in a big room, a soundproofed room, a large concert hall or even a cave or a metro tunnel – all these, to give you versatility and a vast variety of sounds to choose from. Combining a delay, a chorus and a reverb pedal will let you create the famous wall-of-sound some bands are known for. A compressor normalizes the dynamic range of the input signal with a threshold value. It is heavily used in song recording and mixing. Its benefit is that all notes will have similar amplitudes, being equal in volume as a consequence. The compressor can also be used to increase the note being sustained beyond what could be obtained physically on the instrument. The noise gate is used to reduce the parasitic noise produced by noisy pickups, high gain or poor cables and connections. It helps you deliver a much clearer sound, lacking in background hiss, and it also filters out the noise which naturally occurs when playing on stage. Popular in the 80s and 90s was the Wah guitar pedal, made famous by many players who are or were active in the rock and metal scenes. It is still being used, and mastering it can add a lot to your sound. A wide range is provided by most devices, ranging from a short tone up to the longer sweeping inflections. There are some digital models which offer a new and increased range of sounds. In the end, there are so many guitar effect pedals that it is impossible to cover all of them. The ones mentioned above are used by many guitar players these days. If you want to add more to your sound, you can go to the closest music shop and try out some exotic models, until you find something you view as missing from your gear.